Take a look to our bead ring models ! Here's how to make a frame covered with patchwork-style fabric. The rustic look of this kind of frame is heightened by the choice of fabrics, all selected because they are of the same color: a fine shade of red. Easy techniques (glueing/collage, a few embroidery stitches and some sewing) are used to create this unique design that's really you! 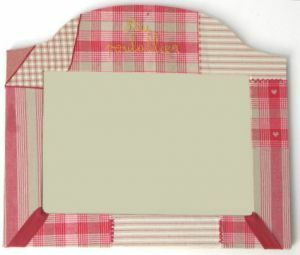 The frame can hold a magnetic board or a blackboard, or a scene made from fabric too, combining felt with various other fabrics, as seen in the "The hens in the henhouse" board. Start embroidering the fabrics that are to be stuck to the frame: such as the wording "The Henhouse", which you write first of all in pencil to act as an outline. 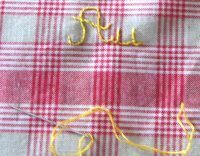 To embroider cursive writing, the crewel or stem stitch is very suitable, using 2 strands of thread. This looks great and is very easy to do: the pieces of fabric are attached edge to edge and where they meet, a thread (a 6 strand thread) is attached, creating a little contrast (glue the ends of the threads firmly to the back of the frame). 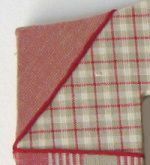 To highlight the bottom right and left-hand corners, attach a piece of red bias tape. 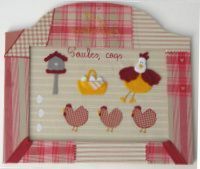 Once the frame is finished, you just have to fix it to a surface and it can be used as a photo frame, a magnet board or, as seen here, a hen-themed picture in felt and fabric.